Sure there’s pressure. That’s because every little mistake is magnified, said Bissonnette, who plays the clarinet. 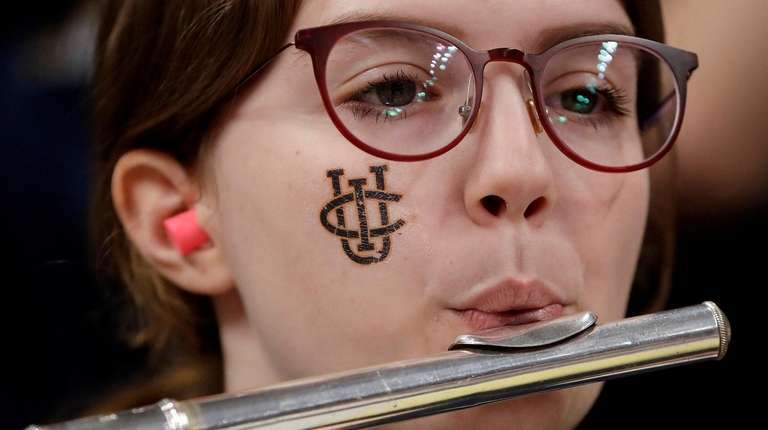 Yes, we are talking pep bands, which are as essential to the NCAA Tournament as the basketballs (and are far more popular than the referees). What would a Big Dance be without music? You could say bands provide the soundtrack for the tournament, but that would not capture the flavor. Better we should call them the heartbeat of March Madness, enlivening the whole experience and making it thoroughly more pleasurable than the over-pumped, over-amped, canned noise at professional sporting events. A pro game now is an assault on the senses. A college game is a visit home, with an occasional sense of humor. Getting a band to a regional is the musical equivalent of breaking an intense full-court press. Right after Selection Sunday, every school has to pick which band members will make the trip — the NCAA allots precisely 29 seats to each band, ensuring that the big schools don’t blow away the Cinderellas. Suffice it to say a tuba will not fit in the overhead compartment. A truck or bus carries the equipment, sometimes all the way to a tarmac, then another vehicle meets the plane and brings it all to the arena. During games, the protocol is tightly choreographed by tournament officials. Someone with a headset is with each team’s band, telling the group when it is its turn to play and how many seconds it has to finish the number. Hey, sometimes you’ve got to take as well as you give. That’s March Madness, where the musicians, like the guards and forwards and big men, play their hearts out.